I have been in and out of blogging for quite some time now. And to be honest, I am struggling. I have yet to find my voice and my style, and consistently write and publish posts that are reflective of what is truly going on in my head. I started blogging in i.ph (thevideokequeen.i.ph) probably around 2006 or 2007 and have since lost all my posts there when i.ph went on “permanent vacation”. Back then I wrote about my thoughts, how I felt about stuff, whatever happened during the day, or a huge event that I went to. Then I moved to blogspot around 2009 (thevideokequeen.blogspot.com), which I have managed to keep until now, albeit missing a lot of posts from around 2010 to 2012. That was the time I had a self-hosted blog (thevideokequeen.com) on WordPress.org, a move that was totally unexpected, but proved to be quite fulfilling. The idea of managing and focusing on building your own site actually made me write more, focusing on music and events, and making concert or album reviews. I really enjoyed what I was doing, and then the site got hacked. Unfortunately, I don’t have any backups on my posts and lost everything. I tried to post on my original blogspot account, but the pain of lost memories lingered. I lost steam. All throughout these blogging “episodes”, I have retained the blog title “videoke queen.” I guess maybe it’s because it is only when I am singing, facing a videoke machine, that I learn to let go and just enjoy the song. I edit a lot when I write. And if I am left to do as I please, I will edit and critique my work until I end up not writing anything. It’s awful. My blog title, I think, is my subtle reminder to let go and be unafraid to share my thoughts. It’s a work in progress. Fast forward to several years and unwritten stories, I find myself in a different location experiencing a lot of new things and meeting a lot of people. For the past year, I have resorted to posting photos on Facebook to capture these “moments”. It’s not enough, though. I realize I have to go back to writing again and sharing the blizzard of insights and ideas whirling inside my head. It’s time to revive the videoke queen but this time, I guess I will be sharing different stories. I will try to make it more personal, and reveal more of my thoughts rather than just chronicling a concert or a show. Thus, expect posts on various subjects from now on. It’s a huge risk for me, opening up like this. But I guess the best way to connect to people is to give more of myself. Have you ever struggled like this? If yes, how did you deal with it? If you follow me on Twitter (@thevideokequeen), you’ll notice that I post a Paper.Li link religiously around 6pm of every day about the latest tweets, links, photos and videos from our favorite OPM artists. Paper.Li is a site that allows one to curate tweets based on certain topics and Twitter accounts and presents this in a newspaper format. Several months ago, I thought of compiling a list of Pinoy artists and sites and putting them altogether, thus, Notes from the Videoke Queen is born. I don’t really check it everyday but I notice that artist/s (that’s Rivermaya!!!) are starting to notice it and thank me for it. Yay! 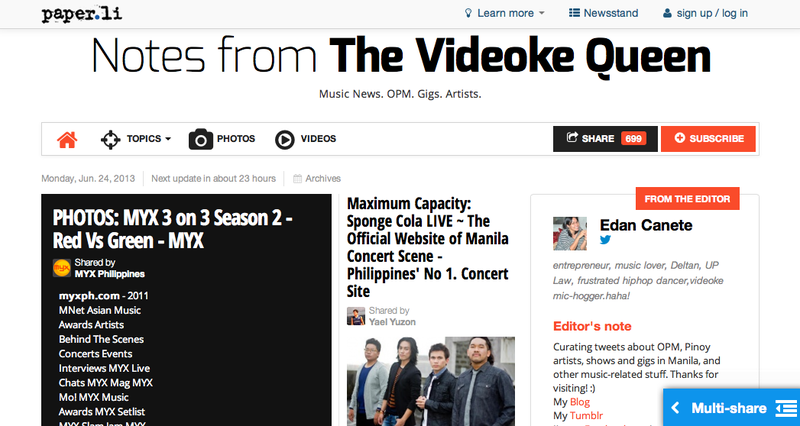 It’s really a good source of OPM news, what they’re up to and what they’ve been posting and sharing on Twitter. Yesterday’s edition led me to 2 interesting articles on The Oktaves (Ely Buendia+Hilera) and Rice Radio’s feature on Parokya ni Edgar. Do check it out Paper.Li’s GENIUS!! Follow me on Twitter to get these updates and more (randomness from yours truly) – @thevideokequeen. Thanks! !